All of Toni's dogs have made it to at least G6 if not G7. This has proved invaluable in keeping her up to date with modern agility training. Toni is extremely proud of all her dogs and all that they have brought to her family's lives. Below is a brief outline of their agility achievements. 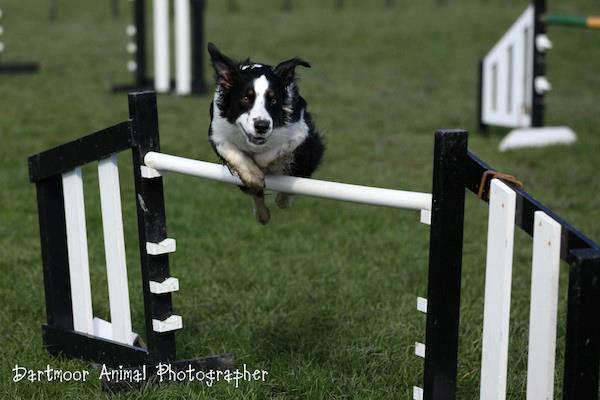 Kye was Toni's first ever agility dog - and a steep learning curve! 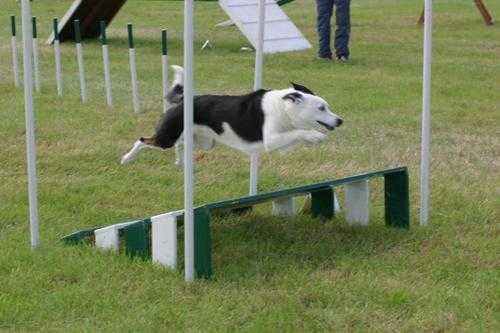 He is the reason that SWAT even exists as, without him Toni would never have become so addicted to agility! Kye took her from Starters (grade 1) to Senior (grade 6) before he became epileptic and was diagnosed with Hip dysplasia. He continued to compete until he was 9 years old at G6, and then he moved into Anysize - where he was as wild as ever! Kye always screamed his way round the course and did everything at full speed - not the easiest first agility dog!Kye had a very happy and long retirement, keeping the rest of the pack in order and being spoilt rotten (he was the only one allowed upstairs to sleep!) Despite all his ailments he made it to the ripe old age of 15 before Toni had to allow him to go - he was ready but that didn't make it any easier.He is most definitely her dog of a life time. Boo was a shock to the system - She was so slow compared to Kye! She was scared of all contacts and would crawl over them on her nails. Toni worked hard to increase her drive and confidence, and she made it to G7. Boo is such an honest dog she has run for lots of people throughout her career, and helped many Junior handlers to gain confidence in the ring, even going to Crufts via the YKC. She competed in numerous finals including Championship classes - a very distinguished career from such a nervous start. She retired from agilityin 2015 but still enjoys running through the odd tunnel when she can! Raq - what can anyone say?!?!? 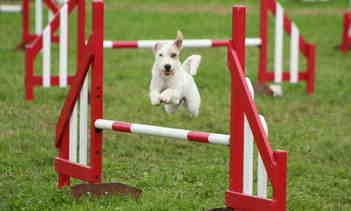 - Toni says he is probably her agility dog of a lifetime. He is simply an amazing dog to own and train. 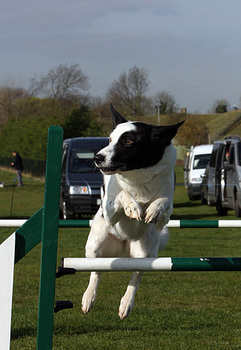 A lovely temperament, easy to live with but loves agility and is a natural. Training this dog has always been so much fun for Toni; he learns so quickly. Raq went from G3 - G6 in his first season despite being at G3 for 3 months due to the old system of moving up. He never left a show without a top 3 place. He then had a year out as Toni was pregnant and the following year he went to G7. He also made it to a number of finals. Who knows what he would have achieved if he hadn't had time out and hadn't got a handler with baby brain!?! Raq is one of those dogs that make people go 'wow!' at the side of the ring - Toni feels so very lucky to have him. He taught Toni lots about handling and training, including the importance of working from a distance!He has sired four litters of pups and given Toni a much longed for Raq puppy :-)In 2015 he retired to Anysize - he is as fast as ever and Toni doesn't want him to injure himself on twisty G7 courses. He needs to be able to enjoy a long retirement. Maid instantly became Lily's best friend - the terrible twosome up to no good together! She has a great work ethic, and a fabulous temperament, and is bomb proof with Lily and Adam :-) Maid managed to run into a door frame at only 12 weeks old and Toni has been fighting the results of that injury ever since with the help of the SMART clinic. Maid's training has also been hindered by Toni's pregnancy and being out of action for so long. However Maid competed in 2012 at a few shows with Toni basically standing still! She still managed to win to G4 - clever girly! In 2013 Toni concentrated on getting Maid better trained - tighter turns, faster contacts and weaves - so in 2014 Maid won to G5, despite doing very few competitive runs. Maid is probably the cleverest dog Toni has ever owned, learning new skills in a very short space of time.In 2015 a Maid x Raq litter came. 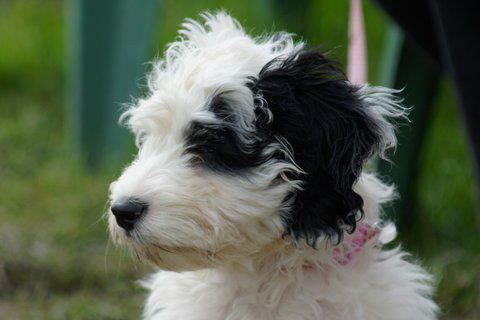 Toni's newest dog Bang is from this and everyone hopes he will have both Raq's and Maid's fab drive and lovely natures. In 2017 Maid is currently being handled by Toni, Tash and and Toni's 9 year old daughter. She has won to Grade 6, and is loving the complicated courses, needing only 1 win to go Grade 7. If truth be told Glee was bought as a diversion after Toni lost Doug - and she has brought Glee into the family's lives by the bucket load! A very cute little girl, with a massive personality and huge ability to get in to trouble!She loves playing with the other dogs, especially Maid - prefers to sleep curled up with one of them if she can - and loves the water! She gets into more mischief than all the collies put together!Glee finally began some proper training in Autumn 2013 and Toni began to compete with her in 2014. By April 2015 she had won to G6, going on to win to G7 in 2017 - all despite having hip dysplasia.Glee is competing with Lily as well as Toni now, and is helping to train other children as well! Bang was bred by Toni from Raq x Maid. He is a huge boy, who Toni picked as the most suitable family pet rather than the pup she felt would be the best agility dog. He has proved to an absolute delight to live with - a very happy boy who takes life in his stride. He loves learning, playing agility, and also being a farm dog - on a Tractor is a fun place to be! In 2017 he started competing and as his confidence has grown so has his speed. He has ended the season winning numerous Grade 3 classes so is now Grade 4. Toni is very excited about his winter training!